To understand the complexities of the notorious second-season syndrome, Jordan Larmour could do worse than picking the brain of the man who he is likely to directly come up against this weekend. Having blazed a trail on the international stage last year, Jacob Stockdale found space harder to come by in the Six Nations just gone, as opposition teams recognised the obvious threat of last season's top try scorer. 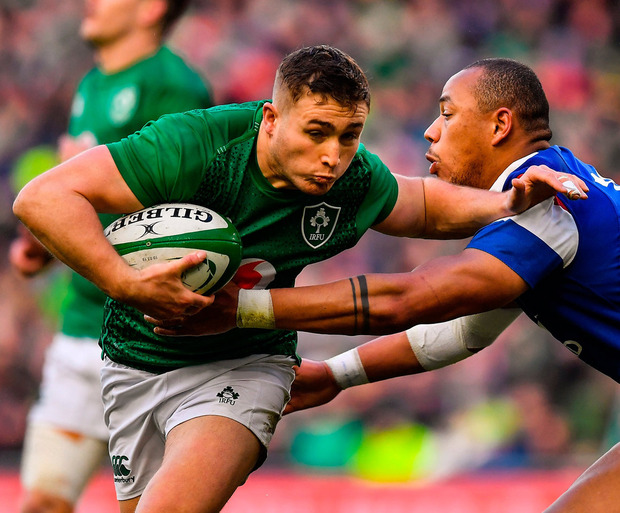 Larmour hasn't had nearly as many opportunities in the Ireland starting XV as his fellow youngster (three starts compared to 19), yet it has become increasingly obvious that he too is now a marked man. "Maybe a little bit," Larmour admitted, when asked if he felt that he had been targeted more often this season. "Teams are always getting better and their defensive systems are always getting tighter so it's harder to break down. "So maybe I've a season under my belt and people know me more now. There is more footage of me to do their homework on me but teams are getting better so those little gaps are hard to come by." The 21-year-old still found a way to use his dancing feet to devastating effect. The fact that his final act in a disappointing Irish Six Nations campaign was scoring a well-worked try against Wales will help ease whatever lingering frustrations exist. With Rob Kearney set to start at full-back in Saturday's showdown against Ulster, Larmour may switch to the right wing, which would see him face off with Stockdale in what promises to be a mouthwatering battle between two of the country's brightest talents. "I suppose when he's on the starting (Ireland) team, I'm on the bibs," Larmour explained. "Training against him, he's a quality player. He's world-class and some of the tries he scores are a bit of a joke. We're going to have to have all hands on deck when he gets the ball... just be ready for anything they come with. "If you give him the ball in a bit of space, he will chip it over you, go around you or go through you. He's a big man. He can score a try from anywhere, so we have to be ready." Larmour versus Stockdale is one of several fascinating sub-plots as Leinster look to avoid an upset and assume their dominance as the best team in Europe. "I wouldn't say (there is a) fear factor," Larmour added. "It's finals rugby and we've been preparing all season to try and put us in the best spot to get us here. "This is the rugby you want to be playing, you want to be in finals and you want to win them. It might be a bit giddy this week because it's knockout rugby."